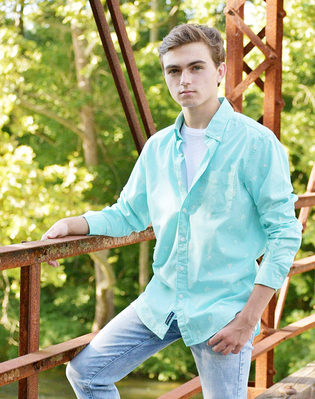 Logan Robertson, a local teen fighting a primary immunodeficiency disorder, will make a presentation on February 13 at 11 am in Moomaw Center at Dabney S. Lancaster Community College, where he attends the Jackson River Governor’s School. Logan’s treatment is made from blood plasma, and donations nationwide are desperately needed. Local residents are urged to donate blood at the American Red Cross Bloodmobile on February 19 on the DSLCC Clifton Forge campus. Sign up in advance at www.redcross.org (use zipcode 24422) or call (800) 733-2767. Clifton Forge, VA (Feb. 5, 2019) - Logan Robertson is, in most ways, a typical and highly motivated Alleghany Highlands teenager. The 17-year-old Alleghany High School senior is a member of several student organizations, including Beta Club and National Honor Society, Key Club and the Emergency Crew Club. He’s on the golf team (he made it to districts and regionals this year) and the soccer team, and enjoys playing saxophone in the AHS band. He also attends the Jackson River Governor’s School at Dabney S. Lancaster Community College and volunteers at Sharon Elementary School, where his mom, Sharon, is the school nurse. He’s thinking of pursuing a career as a pharmacist. On the other hand, Logan is anything but a typical teenager. He’s had to fight an immune disorder, known as hypogammaglobinemia - characterized by a reduction in all types of gamma globulins, including antibodies that help fight infection - his entire life. “His immune system is such that he has no way to fight off infections,” says Sharon. He has little to no immunity to ordinary infections, such as viruses or the flu, and the disorder often leaves him extremely fatigued. The standard treatment for hypogammaglobinemia is IgG replacement (a blood product derived from blood donors), which is usually given intravenously or subcutaneously. Unfortunately, says Sharon, there is a national shortage of the medication, which is produced from plasma. Logan needs the life-saving infusion of the medication as often as every two weeks to keep from getting sick and to stave off fatigue. He will have this treatment the rest of his life. Blood plasma donations are critical, and there has been a nationwide decrease in donations. Logan’s mom and dad, Lynn, have tried to make Logan’s life as normal as possible, sending him to public schools and allowing him to be involved in as many activities as he thought he could handle. “We have known he was immunocompromised since he was really little, but our lives changed when he was a sophomore.” That year, Logan was seriously ill, and transferred to UVA hospital and admitted there. He was unable to return to school after his hospital stay and missed school the whole month of December. That’s when the doctors decided he needed to start infusions, and they marveled that Logan had never been hospitalized before then. The IgG replacement therapy has been a godsend, allowing Logan to live a fairly normal life, but there is the added worry from one week to the next as to whether or not it will be available. Most people have never heard of this condition and are not aware that they can help by donating plasma. To that end, Logan will make a presentation explaining his disorder, the diagnosis and treatment, and how he deals with it all, on Wednesday, February 13, at 11:30 am in Moomaw Center on the DSLCC Clifton Forge campus, and broadcast simultaneously via "Zoom" in Room 912 at the DSLCC Rockbridge Regional Center in Buena Vista. The public is welcome to attend. On Tuesday, February 19, the American Red Cross Bloodmobile will be on the DSLCC Clifton Forge campus from 9:00 am to 1:00 pm in the parking lot outside McCarthy Hall. The Bloodmobile visit and Logan’s presentation are being hosted by DSLCC Student Activities and the DSLCC Alpha Eta Omicron chapter of Phi Theta Kappa, the leading international honor society for two-year colleges, to raise awareness and participation in the blood drive. Anyone interested in donating blood is strongly encouraged to sign up in advance through the American Red Cross’s website at www.redcrossblood.org or call 1-800-RED-CROSS (1-800-733-2767). For further information, contact Sharon Robertson at (540) 965-8038.